In the bus shelter itself, there is a touch sensitive copper tape drawing mounted on a large sheet of acrylic plastic. When a visitor arrives at the site and opens the app, the app will pair with a bluetooth circuit attached to the drawing. 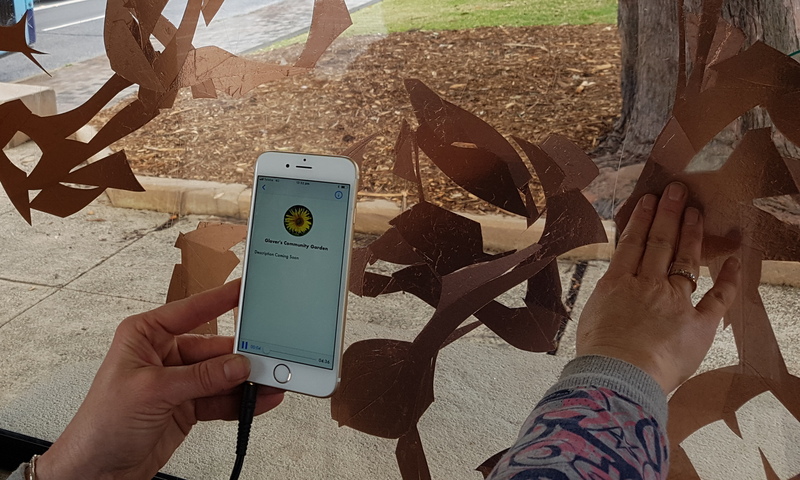 When the visitor then touches the drawing, they will hear binaurally recorded sounds and stories of communities and community spaces and initiatives in Sydney’s Inner West. For those who are unable to access the work in the bus shelter, there is a tappable version of the artwork in the app itself. The work was developed by artists Susannah Williams and Warren Armstrong, courtesy of an Arts and Culture Grant from Inner West Council. It will be accessible from Friday 4th August until Sunday 29 October 2017. Thank you to all our audio contributors – it was a pleasure listening to you.